Figure 1 Cutting edge of functional fluids engineering by fusion. Figure 2 Establishment of electromagnetic functional flow systems. Figure 3 Research frontier of functional fluids. (2) 西山秀哉他9名，日本混相流学会，機能性流体のマルチスケール流動とシステム化に関する研究分科会活動報告(R&P Committee 6)，(2010), pp.1-135. 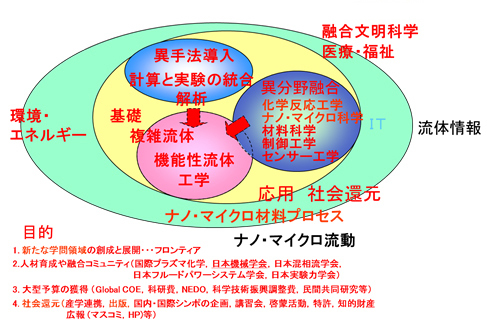 (6) 西山秀哉, 知能流体システムの基礎と応用, フルードパワーシステム，第32巻,　第5号(2001), pp.318-321. 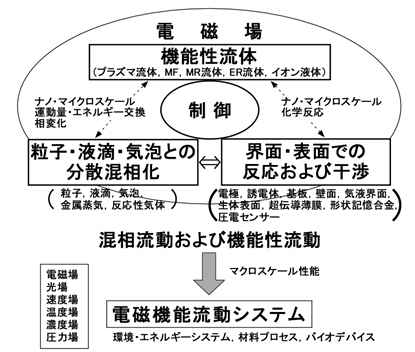 (7) 西山秀哉，機能性と複雑構造を有するプラズマ流体の流動と応用，日本機械学会論文集B編，Vol.75, No.753 (2009), pp.901-904. (8) Sato, T., Solonenko, O. P. and Nishiyama, H., “Evaluations of Ceramic Spraying Processes by Numerical Simulation”, Materials Transactions, Vol.45, No.6 (2004), pp.1874-1879. (9) Takana, H., Ogawa, K., Shoji, T. and Nishiyama, H., “Computational Simulation on Performance Enhancement of Cold Gas Dynamic Spray Processes with Electrostatic Assist”, Journal of Fluids Engineering, Transactions of ASME, Vol.130, No.8 (2008), 081701. (10) Shigeta, M. and Nishiyama, H., “Numerical Analysis of Metallic Nanoparticle Synthesis Using RF Inductively Coupled Plasma Flows”, Journal of Heat Transfer, Transactions of the ASME, Vol.127, No.4 (2005), pp.1222-1230. 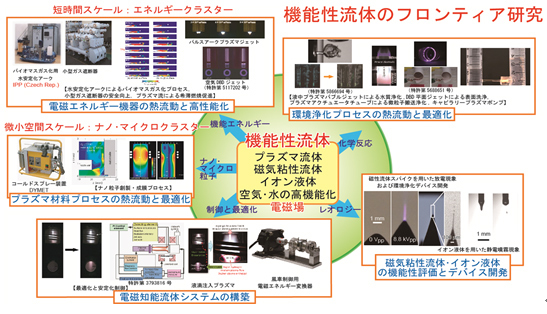 (11) Nishiyama, H., Sato, T., Niikura, S., Chiba, G. and Takana, H., “Control Performance of Interactions between Reactive Plasma Jet and Substrate”, Japanese Journal of Applied Physics, Vol.45, No.10B (2006), pp.8085-8089. (12) Kawajiri, K. and Nishiyama, H., “In-flight Particle Characteristics in a DC-RF Hybrid Plasma Flow System”, Thin Solid Films, Vol.506-507 (2006), pp.660-664. (13) Jang, J., H. Takana, J., Ando, Y., Solonenko, O. P. and Nishiyama, H., “Preparation of Carbon-Doped TiO2 Nanopowder Synthesized by Droplet Injection of Solution Precursor in a DC-RF Hybrid Plasma Flow System”, Journal of Thermal Spray and Technology, Vol.22, No.6 (2013), pp.974-982. (14) Jenista, J.,Takana, H., Nishiyama, H.,Bartlova M., Aubrecht, V., Krenek, P., Hrabovsky, M., Kavka, T., Sember,V. and Maslani, A.,”Integrated Parametric Study of a Hybrid-Stabilized Argon-Water Arc under Subsonic,Transonic and Supersonic Plasma Flow Regimes”, Journal of Physics D: Applied Physics, Vol.44, No.43(2011),435204(20pp). (15) Takana, H., Nakakawaji, S., Uehara, S. and Nishiyama, H., “Nano Powder Transportation by Combining Plasma Actuation and Electrostatic Mixing in a Tube”, Journal of Fluid Science and Technology, Vol.10, No.2 (2015), 0011. (16) Nishiyama, H., Niinuma, K., Shinoki, S. and Takana, H., “Decomposition of Acetic Acid using Multiple Bubble Jets with Pulsed Electrical Discharge”, Plasma Chemistry and Plasma Processing, Vol.35, No.2 (2015), pp.339-354. (17) Shibata, T. and Nishiyama, H., “Acetic Acid Decomposition in a Coaxial Dielectric Barrier Discharge Tube with Mist Flow”, Plasma Chemistry and Plasma Processing, Vol.34, No.6 (2014), pp.1331-1343. (18) Uehara, S., Ishihata, K. and Nishiyama, H., “Development of a Capillary Plasma Pump with Vapour Bubble for Water Purification: Experimental and Theoretical Investigation”, Journal of Physics D: Applied Physics, Vol.49, No.40 (2016), 405202. (19) Nishiyama, H., Sawada, T., Takana, H., Tanaka, M. and Ushio, M., “Computational Simulation of Arc Melting Process with Complex Interactions”, Iron and Steel Institute of Journal International, Vol.46, No.5 (2006), pp.705-711. (20) Jang, J. and Nishiyama, H., “Discharge Study of Argon DC Arc Jet Assisted by DBD Plasma for Metal Surface Treatment”, IEEE Transactions on Plasma Science, Vol.43, No.10 (2015), pp.3688-3694. (21) 高奈秀匡，西山秀哉，”内燃機関燃焼促進のための極短時間パルスDBD放電構造解析とエネルギー効率評価，日本機械学会論文集B編，Vol.79, No.801 (2013), pp.1005-1015. (22) Nishiyama, H., Hamada, K., Uchii, T., Kawano, H. and Tanaka, Y., “Transient Response Simulation of Downstream Thermofluid Field in a Gas Circuit Breaker during Current Interruption”, JSME International Journal, Ser.B, Vol.48, No.3 (2005), pp.381-388. (23) Nishiyama, H., Katagiri, K., Hamada, K., Kikuchi, K., Hata, K., Park S.-K. and Nakano, M., “Evaluations of Cluster Structure and Magneto-rheology of MR Suspensions”, International Journal of Modern Physics B, Vol.19, Nos.7-9 (2005), pp.1437 -1442. (24) Nishiyama, H., Takana, H., Shinohara, K., Mizuki, K., Katagiri, K. and Ohta, M., “Experimental Analysis on MR Fluid Channel Flow Dynamics with Complex Fluid-Wall Interactions”, Journal of Magnetism and Magnetic Materials, Vol.323, No.10 (2011), pp.1293-1297. (25) 原田真琴，上原聡司，高奈秀匡，西山秀哉，漏洩遮断のための磁場下にある分岐管内MR流体のクラスター形成と流動特性解析，日本機械学会論文集,，Vol.81, No.823 (2015), 14-00547. (26) Uehara, S., Itoga, T. and Nishiyama, H., “Discharge and Flow Characteristics using Magnetic Fluid Spikes for Air Pollution Control”, Journal of Physics D: Applied Physics, Vol.48, No.28 (2015), 282001.